Certainly one of the most enigmatic figures in jazz history, Thelonious Sphere Monk has been described as eccentric, brilliant, weird, pioneering and crazy, among other conflicting characterizations. In this meticulous biography of the jazz legend, Robin D. G. Kelly gives a highly detailed accounting of Monk’s life and his music, out of which emerges a far more complex human being and artist than we had been led to expect. 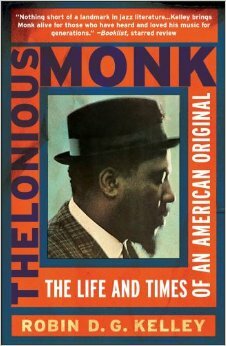 Thelonious Monk, published by Free Press in 2009, is the product of 10 years of diligent research by Kelly, during which time he was allowed extraordinary access to the man’s family and close associates. This is a chronicle that proceeds day by day, gig by gig, composition by composition, in what sometimes seems almost like real time. Kelly is an academic, and while his writing is admittedly not elegant, it is surely rich with information, much of which is revealed for the first time. Often portrayed as some kind of “noble savage” lacking any formal education in music, remembered for his strange behavior—getting up from the piano and dancing around in circles on stage, falling asleep at the keyboard, sporting strange hats, staring off into space and wandering out of nightclubs during gigs—in Kelly’s telling, Monk emerges as a well educated musician who, beginning at the age of 11, studied Bach, Beethoven, Chopin, Rachmaninoff and Liszt, a family man and artist who suffered financially even after he became one of the best known artists in jazz. The book also provides us a glimpse into the New York jazz scene of the late ‘40s and early ‘50s, when bebop was supplanting swing, with Thelonious Monk playing a crucial role in the development of the new music and yet, strangely, somewhat on the periphery of what was happening. Thelonious Monk was born in Rocky Mount, North Carolina, in 1917, moving at the age of four with his mother and two siblings to the San Juan Hill neighborhood of New York City. As his interest in music grew, he absorbed the influences of gospel music and hymns, along with the stride pianistics of players like Willie “the Lion” Smith, Eubie Blake and James P. Johnson. He went on the road in his teens, returning to New York at 22, when he formed his own quartet. Unlike peers like Miles Davis, Dave Brubeck and Duke Ellington, Monk had no interest or skills in building a career, and, in fact, while he did achieve fame, fortune eluded him all of his life. In the end, we learn that Monk’s erratic behavior was at least in part the expression of a bipolar disorder, a condition he inherited from his father. It leaves one wondering if, had Monk been born at a time when more advanced treatments were available, the man might have followed a very different path. But we can only wonder. For even the casual jazz listener, Thelonious Monk is an important document, one that sets the record straight at last about one of the most significant figures in the history of our music.